Beautiful sunrises, warm waters, sharks teeth, and the relaxing summer breezes greet you each morning as you get ready for a casual easy vacation. The refreshing sunrise picture on the left illustrates the tranquility of this beach vacation. If you love to shell hunt, read books, or just sit back and count the sea gulls, this is the site for you. This is a laid back, non-commercial, no frills island where the family is the ideal vacationer. 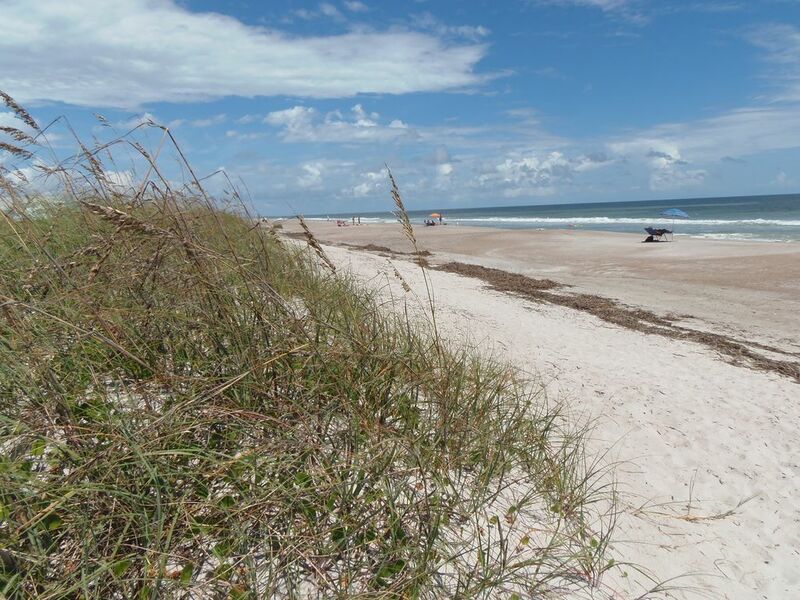 Only 50 footprints to the ocean and 13 miles of unobstructed beaches. Surf fishing, beachcombing, and sunbathing are the activities of choice on our private beach just steps away. All you need for a wonderful vacations are your beach towels and sunscreen. Owners live upstairs. Retired Teachers. No pets. Love to travel. we are both artists. Have five grandchildren. Very close to beach and quiet. Parking out front is helpful and useful for renters. Lovely yard with great deck on south side. Walking distance to restaurants and state parks. very little traffic because it is off the beaten track. Love to shark tooth hunt and watch pelicans. Staying a week is definitely the way to go at Pelican Palms. The rate is reduced and allows two people to stay cheaper. The rate includes two people with $65 up charge for each person, up to 4 people. We are definitely the cheapest stay on the beach with the most to offer. only fifty steps to the beach walkover from your lovely and quiet deck. Everything you would need to cook every meal. Just bring your food. fully stocked kitchen, microwave, coffee pot, pot and pans, stove, refrig, diswasher and all linens. Eat in kitchen and table on deck provides a place to eat outdoors. Three steps to front door and off the deck. Fully-Stocked Duplex, All you need is a beach towel and snacks. close to restuarants and skate park. Only 50 footsteps to beach walkover. Great place to stay. Had everything we needed. So close to the beach. The house was very nice and clean. We really enjoyed our stay. Thank you for chosing our beach house. Hope to see you again soon. It is a small world. Relaxing in a great location! Great place for us. Met all our needs. A very short walk to the beach which is beautiful and not crowded. We enjoyed the location as it was not far from downtown and other points of interest. We enjoyed our stay. We hope to return. Area is lovely and the cottage was very comfortable. It was a straight shot to the main shops and resturant. I would book again do some of the water type things. A two minute walk to the beach! The apartment was very clean and spacious. The kitchen has every gadget and appliance you could ever want. The keyless door lock was a plus when making a quick trip to the beach - no worries about losing the key. The beach is beautiful and had very few visitors during my trip. The close proximity made it easy to hit the beach several times a day, you can easily pop back home for snacks and bathroom breaks. We loved our stay here. The unit was spotless and everything we could possibly want was available. Very comfortable, especially enjoyed the deck overlooking the ocean and just being outside, walk 15 steps and you're on the beach! The owners are extremely helpful and accommodating. A really great place to stay..i will be back..loved it!! Brand new skate park within a block walking distance. Kids love it.